• Only Pokemon from Unova can be used (excluding Victini, Reshiram, Zekrom, Kyurem, Keldeo, Meloetta, and Genosect). • Each match is a double battle, though the amount of Pokemon each player will use in a match is not mentioned. It might be bring six Pokemon and use four in each match like in the past. • Pokemon should be Level 50. Pokemon higher than that will be lowered to 50, but Pokemon Level 49 and below will remain the same level. • You can't use duplicate Pokemon or Items. • You can't change your Pokemon, Items, etc. during the tournament. A whole new wooooooorrrllllld...Well, my fellow Black/White obsessors, here we are again, to talk about an aspect of the positively fergalicious new games we have been given by the gods of gaming at Nintendo. Black and White, like all new generational installments of the series, gives us a new region to nerd over(yes, nerd is now a verb). Let us do so now. If you haven't finished the game yet and don't want the entire world of the games ruined for you, turn back; here there be spoiler monsters. But don't worry, those who have only just finished defeating N for the final time, the only specific areas I'll be discussing are those found before completing the game. Well, guys, here we are at last. Black and White are out, and all(or at least most) of us are enjoying them, and you're probably playing your game as you read this. (Don't worry, it's okay, I'm level-grinding as I write) Now, these games are obviously huge, but we're going to start small. We're going to be looking at the starters of Unova, and some of the Pokemon encountered early on in the game. 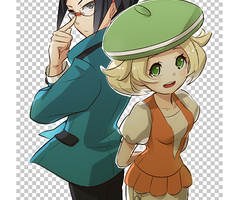 So, let's jump into Unova! It's been a video filled week. Here is another to enjoy. Join players from around the world and get ready to compete in the 2011 Pokémon Video Game Championship series! The series starts this spring and consists of multiple events across the United States and Europe—events where anyone can compete. Top players from the National Championships will be invited to the Pokémon Video Game World Championships, taking place this August in San Diego, California! Here’s a quick snapshot of the major changes you’ll see at the 2011 Pokémon Video Game Championship competitions. All of the events will be played exclusively on Pokémon Black Version and Pokémon White Version, which will launch in early March. Players will be limited to Pokémon from the Unova Pokédex only, and no two Pokémon on a player’s team can have the same Pokédex number.